The “Tamil language production of Mettikaraththaya” refers to Mirhchakadikam, a Sanskrit play written in B.C. 300-400 by Chudraka. It was produced in Tamil as ‘Kaliman Vandi’ translation of the Sinhala version of Mettikaraththaya at the Swami Vipulanda Institute of Aesthetics Studies, Batticaloa, Sri Lanka. 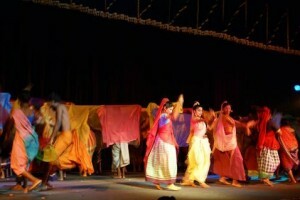 The production was a joint venture of the Drama and Theatre Department of Swami Vipulanda Institute of Aesthetics Studies and Janakaraliya Theatre Group. The program was funded by the India-Sri Lanka Foundation and HIVOS Netherlands. The play was directed by veteran Sinhala Drama and Film director Parakrama Niriella and its Executive Director was the veteran Tamil Drama director and theatre scholar Prof. S. Mounaguru. It was said that the purpose of the production is to educate and enhance the theatre knowledge and skills of the students of the Drama Department of the Swami Vipulanda Institute of Aesthetics Studies. The students who performed in the play did their justice to their capacity. But the question remains: to what extent does the play represent the performance tradition of Sanskrit Theatre or an innovative theatre of the modern world? The play simply looks like a failed commodified South Indian Tamil Film. The dance and music sequences of the play added to this impression. The important issue to be discussed at this juncture is the theme of the play. It is not just an ethical one but a serious conceptual issue in the present world, where gender sensitivity and feminist perspectives are part of the ideas and ideologies of our society. Shouldn’t this be included in the educational process of Drama and Theatre? Charudhatha, the hero of the play, is willingly sent off by his wife to the “genuine” concubine. She also accepts the concubine as the real partner of her husband, because she accepts that Charudhatha will be blissful only in Vasanthasena’s presence. Who constructed the thought pattern of Charudhatha’s wife? How is the theme of the play relevant not only to the Educational purposes of the particular students’ community but also to the audience in common? Is it reasonable to educate people about the technicalities of a play without dealing with its theme and concepts? Are we going to celebrate the “true love” of Charudhatha and the “genuine” concubine Vasanthasena, and the sacrifice of Charudhatha’s wife? Or do we want to initiate a dialogue on the victimization of women and their exploitation by men in Art and in Society? Aren’t these issues connected with the educational process in Higher Education Institutions like Swami Vipulanda Institute of Aesthetic Studies? Most cases of domestic violence and violence against women are related to the theme of the play ‘Kaliman Vandi’ (Mettikaraththaya). What would have happened if Charudhatha’s wife reacted to the suggestion negatively and said NO? Anyone can find out the answer by analyzing cases of domestic violence and violence against woman in their surroundings or in the records of nearby woman’s organizations or the woman’s desks in island-wide police stations. Theatre training or theatre education is not mere transmission of the knowledge and skills of theatre Arts. It has to be connected with the transformation of perspectives in the mindset of pupils or people in society. Ironically, the play has failed to deliver this transformation, which was expected from these well- experienced directors, especially in the contemporary context of activists’ struggles against increased violence and discrimination against women in our society. Three questions have to be answered in this regard. Why did both the veterans choose the play‘Kaliman Vandi’ (Mettikaraththaya) to be produced in a post-war period? Why did the funders support a theme questionable in the current world, where many programs on gender sensitivity and empowerment of women are taking place with the support of governmental and non-governmental sectors? What is the position of an academic institution when its curriculum is unsuited to issues important in the contemporary world? The original play has the originality of combining political and love intrigue, which together give a significant value to the play. But Chudraka the playwright has claimed that Mirhchakadikam has no precise parallel to the above-mentioned combination. ‘Kaliman Vandi’ (Mettikaraththaya) has left out the political, and highlighted the love between Charudhatha and Vasanthasena. It is important to mention that in the history of modern Tamil Theatre there are no prior examples of a play like ‘Kaliman Vandi’ (Mettikaraththaya) that was chosen and produced before an audience. This is one of the positive aspects of the Modern Tamil Theatre of Sri Lanka. In brief, ‘Kaliman Vandi’ (Mettikaraththaya) did not do justice to the original Sanskrit play, to the modern Tamil Theatre of Sri Lanka, or to the art of translating literature. Sri Lankan Modern Tamil Theatre has a history of its own, and it is created by theatre practitioners and social activists with their own commitment and contribution and with the support of theatre and social enthusiasts. 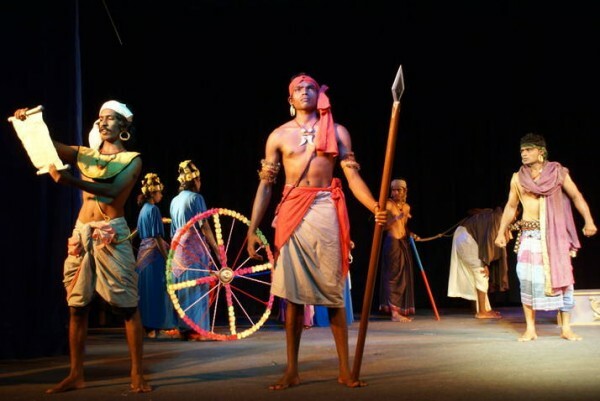 Modern Tamil Theatre in Sri Lanka has responded to situations throughout its history for the last sixty years by innovative and inherited theories and practices of theatre. It is as important to note how traditional theatre responded in times of trouble and turbulence as the modern theatre of Sri Lankan Tamils. Modern Tamil Theatre extended its wings beyond its proscenium theatre stage and travelled through all the nooks and corners in varied theatrical forms in order to engage people on issues including ethnicity, caste, class, gender and environment, from the nineteen seventies and nineteen eighties. The Educational Theatre of modern Tamil Theatre is an organic form of theatrical innovation in the nineteen eighties, and reached its fullest expression in the nineteen nineties. This has to be discussed in detail for its further development and expansion, and the dissemination of information is also required to make it known to the world outside Modern Tamil Theatre. Because scholars, researchers and theatre trainers from outside emerge into the scene of Tamil Theatre and pose as being on a mission to initiate and civilize Tamil Theatre and its practitioners and theoreticians, scholars and researchers portray Tamil Theatre as a non entity in Sri Lankan Theatre. Anthologies on Sri Lankan Theatre will reveal this fact very clearly. It is unknown to scholars and researchers not only from outside but also to the insiders how Traditional Theatres responded and represented reality in times of war, displacement and natural disasters. The essence of the Community Theatre aspect of Traditional Theatre has had the elements of community integration and participation, and it played a vital role where Modern Theatre practitioners did not have the chance to react and respond in times of restrictions. But the undertakers of the traditional theatres are serious in their mission to preserve the “extinct” art traditions and heritages in funded institutions, and transform community art into a commodity art. It is interesting to note that modern scholarship has branded the “folk traditions” as “low traditions” and treated the “classical traditions” as “high traditions”. It has celebrated the aesthetic values and heroic characteristics of the classical arts without questioning the relevance of their themes and issues to the current context, but without hesitation has branded “low traditions” and the values of those traditions as specimens for the museum and the crude practices of the uneducated and uncivilized. The play ‘Kaliman Vandi’ is the Tamil version of Mettikaraththaya and the leaflet issued before the performance aptly represents the above-mentioned modern thought production. Traditional Theatres are the innovations of the past by our ancestors and they have introduced innovations from time to time. Practices in Traditional Theatres are deeply connected with the present. Practicing traditional performances is not an act of digging up buried corpses and conducting processions in madness. It is not the practice of the uneducated or unscientific minds as mentioned by the civilized and the educated. It is an urgent need to re-educate the misinformed in order to understand the traditional and modern in a new spectrum different from the colonial one. The leaflet of the play reflects the above-mentioned misunderstandings when it says the “Tamil-language production of Mettikaraththaya represents Sanskrit Theatre.” The leaflet takes an intriguing wrong step on the aspect of language. “Theatre needs no spoken language and it evolutes sans spoken language several decades ago” says the leaflet, and in fact this is reflected in the performance as well. The spoken language of the play has not reached a minimum acceptable standard. The translation of Kaliman Vandi (Little Clay Cart) from Mettikaraththaya also contributed to this debacle. It is the same story with the Tamil Plays produced by Janakaraliya Theatre Group. A perfect example is the Tamil version of ‘Sekkuwa’. It is a Sinhala play badly dubbed in Tamil. The performance of the Tamil version of ‘Sekkuwa’ is yet another example that substantiates my argument. The leaflet includes a notable statement in it that needs further discussion in detail. It mentions that there is no need for differences in Theatre in the name of language, ethnicity and region. It further states that Janakaraliya Theatre Group will stand firm on this matter against all odds and opposition. The theatrical viability of the above-mentioned statement is questionable, and its political implications are problematic. The statement strongly aspires to eradicate differences but does not bother about discrimination. The text and sub-text of the leaflet resembles the missions of Multinational Corporations. Flying saucer like interventions will bring diversions and distortions to practice which instead needs support from consistent practitioners of the art. This program is simply an example, but there are various flying saucers overhead and underneath the feet. Stakeholders of a program like this must think twice before producing such backward plays, and be mindful that conscious people are aware that these kinds of missions, even though appearing to bridge the ethnic divide, resonate patriarchy and provoke violence against women. Before commenting on this article it may be good for the uninitiated to introduce S.Jaysankar, who I believe was the Lecturer at the Eastern University(EU). He has written and produced some succesful plays relating to environment,and has acted in ‘Ravanesan’as Ravanan, produced by Dr.Mownaguru and has also published the English Magazine ‘Third Eye’ through the English Forum at the E.U. for which magazine late A.J.Canagarena used to contribute a lot. He states that the play under review was like a failed commodified South Indian Tamil film.If what he says is true then we are back to the days of late 60s,early 70s just after the South Indian Sabha type plays when the Kotahena tradition of plays were just remakes of South Indian trash films.The producers and actors of these plays absolutely had no sense of modern Theatre. But soon starting mid 70s,E.Sivanandan’s Vidivai Nokki'(Enkal kulu),N.Suntharalingam’s ‘Apasuram'(Koothaadikal),an absurd play inspired by a play by Ionesco, Tarcisius, Sivapalan and others of ‘Nadodikal’ produced Mahakavi’s ‘Kodai and Sivapalan’s ‘Ivarkalukku Vedikkai’, a play in Verse and ‘an experimental play’ both of which were first banned,later Makakavi’s ‘Puthiyathoru Veedu’,a stylised Play, Ampalaththaadikal’s ‘Kanthan Karunai'(N.Ragunathan) which was later produced by Tarcius,Mownaguru and others combining the Tamil Koothu tradition and Kandiyan dancing-which incidentally was a great success, Mownaguru’s ‘Sankaram’ were all great plays many of which were later presented in Jaffna after the 1983 riots when most of them went over to Jaffna.During the late 70s Balendra produced ‘Malai’ and ‘Kannaadi Varpukkal’,during this period Zuhair Hameed was one exception from Colombo who produced beautiful plays like ‘Dial M for Murder’ and Ambi’s ‘Vethalam sonna Kathai’ again a play in verse. Ladies Weeeramani a great actor and singer produced ‘Salome’ probably translated from the original play in English by Ana.Naana.Kandasamy. Tamil plays were really good during this period both in content and style. Tamil plays competed with Sinhalese plays in the same National Theatre festival by Ceylon Arts Council and won.Dr.Sivathamby highly commended the social content of the Tamil plays compared to Sinhala plays which were mostly adaptations. When most of these producers and actors went to Jaffna(after the 1983 pogrom against Tamils where more than 3000 Tamils were killed in Colombo) people like Kulanthai Shanmugalingam and others already producing plays joined Tarcius’s Theatre workshops and started to produce plays diffrently from Kalai Arasu Sornalingam School of Theatre. During the War period in Jaffna Street Plays became the vogue to teach the people of the struggle of the oppressed Tamils. Later Sithamparanathan’s Theatre movement became very popular.This then was in short the history of the vibrant Tamil Theatre and if it is said that this play was to teach Theatre to Tamils and if it was a play like South Indian films then much more is desired. Further one can not agree with what the leaflet says with regard to language, ethnicity etc. because the problems of the Tamils were completely different from that of the Sinhalese(If they had one- of course they had caste differences) but Tamils certainly needed a different type of theatre. 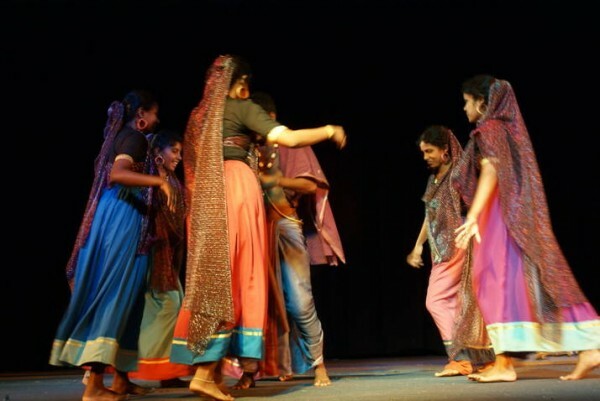 Of course Theatre should not be used to create dissention between communities but different types of Theatre are necessary depending on the problems faced by each community.Gender sensitivity is important and perhaps even a Norwegian play like Henrik Ibsen’s ‘Dolls House’ may be staged both in Tamil and Sinhalese. I guess I would be the least qualified to make any comments about the tamil theatre. However the fact that the play was staged in Bati is welcome. Would be nice to know when in bati a play like this was held last. Best wishes to all actors actress directors and critiques. Even though I haven’t get to see the drama mentioned in here, my understanding of the criticism is very harsh. May be the writer may not be a usual drama analyst. He instead of encouraging the young artists for doing their best to the Tamil Drama in SriLanka considering the circumstances; writer seems to be engaged in either a political row or row with an artist in the Drama. Please get over with this nonsense at least now and help develop Tamil Drama which have been taken over by LTTE political propaganda units up to recent days. At least these pundits should understand art and sending a political message are two different things. Because if you want to send a message you can even send a telegram; now a days it is much easier you can even send a SMS, you don’t need Art for that.